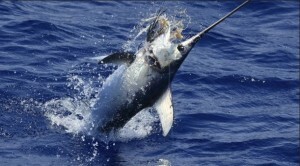 Fish Facts: Can swordfish be safely released ? Swordfish are a species that are highly susceptible to barotrauma. BROADBILL swordfish (Xiphias gladius) are interesting as they are considered to be the most primitive of the billfish. As the only member of the Family Xiphiidae they are also unique as they differ from other billfish in a number of internal and external features, including the absence of pelvic fins and the loss of scales in adult fish. The most notable difference, however, is their very conspicuous long, flat bill which contrasts markedly with the shorter, rounder cross-section bills of the marlins and sailfish. This broad bill not only gives these fish their common name, it undoubtedly has a hydrodynamic function, reducing drag at high swimming speeds, but also is commonly used as a weapon to stun or kill prey. The importance of the bill to their survival is highlighted by the fact that it is well developed even when the fish is only 10 mm long. As far as a gamefish targets go, broadbill have a growth potential exceeded only by the largest of black and blue marlin. Male broadbill only grow to around 2.2 m long and around 120 kg, but the females grow much faster than males and can reach over 4.5 m long and in excess of 600 kg. Size at maturity for 50% of broadbill is around 100 cm short length (eye to tail fork) for males and 140-150 cm for females, at around 5-6 years of age. Spawning mainly occurs in tropical areas during the spring and summer months and broadbill larvae are most commonly encountered in surface waters above 24°C. Broadbill occur worldwide in tropical and temperate oceans, but their distribution in temperate areas is limited to surface water temperatures greater than about 13°C, and indeed the smaller fish (under around 160 cm) tend to remain in even warmer waters above 18°C. Genetic analyses have found that there is minor genetic differentiation between 4 stocks of broadbill which occur in the North Atlantic, South Atlantic, Mediterranean Sea, and the Indian and Pacific Oceans. In each of these major oceans broadbill range widely, but with predictable seasonal movements. Larger fish tend to migrate to temperate waters during the summer months and return to tropical waters during the winter months. In contrast, smaller fish tend to remain in tropical waters all year round. Targeting broadbill is a great challenge for recreational fishers, and in Australia until recently the main challenge was finding reliable concentrations of broadbill close to the coast. The reality is broadbill can be found anywhere offshore between the water surface and depths of up to 800 m. At depths greater than 600 m near the thermocline the water temperature may be just above freezing, which is why broadbill evolved a "brain heater" which insulates and warms the brain and eyes. Broadbill aren't "warm blooded" like tuna, but larger fish, by virtue of their increased body mass, can remain in cooler waters longer to feed and hence can dive deeper and migrate further into temperate areas than can smaller broadbill. Acoustic tracking and longline capture data indicate that broadbill remain at depth near or below the thermocline during the day, but make feeding forays up into the surface layers at night. So to be able to target broadbill effectively, Aussie anglers have had to put in the time to work out the best spots that concentrate the fish, which are usually near current fronts that form above seamounts, canyons and other underwater features. In recent years techniques have changed from targeting broadbill mainly on the surface at night with shallow set baits, to a much more effective daytime deep-dropping technique which sees baits set at depths from 400 to 600 m or more over specific bottom features such as canyon edges on the continental shelf during the autumn and early winter months. Over the past 4 or 5 years this has seen marked increases in the catch rates of recreational anglers fishing out of various ports on the east coast of Tasmania, southeast Victoria and southern NSW. The ability to reliably target broadbill and the increased catch rates has lead to development of a new recreational fishery off our south east coastline, which in turn has lead to a need for science to determine the movements and survival of broadbill released by Aussie recreational fishers. A pilot study of the post-release survival and movements of broadbill caught off Tasmania has recently been completed by Dr Sean Tracey operating from the Tasmanian Institute of Marine and Antarctic Studies and Dr Julian Pepperell from Pepperell Research. The results are very interesting. They found the new recreational fishery caught broadbill from February to July with highest catch rates in March and April. Angler interviews showed a release rate of only 11%, so nearly 9 out of every 10 fish caught were taken home to eat, which is significant when you consider mercury levels in large broadbill often exceed those recommended by health authorities. The average size of the fish weighed was an impressive 177 kg, ranging from 60 kg to a mighty 354 kg. While game fishing for most other billfish species in Australian waters is over 95% catch and release, anglers targeting broadbill have found that many fish simply did not revive very well after capture. The researchers used pop-up satellite tags that were programmed to stay on the fish for a maximum of 250 days. Of the 17 fish caught as part of the research program, only 9 (53%) were in a good enough condition to be tagged and released with an expensive satellite tag. Of these, two fish died within 4 days of release, while the remaining 7 survived the catch and release event, indicating a total release mortality rate of 58.8%. The most common factor identified leading to the mortality of captured broadbill was barotrauma, with 63% of fish being assessed as having either mild or severe symptoms of barotrauma, and mortality occurred in all fish that were unable to descend to recompress the expanded gases even after extended periods of resuscitation. One fish was attacked by a shark, while the only other tagged fish that died was deep hooked in the gut, and died within hours of release. Overall thee fish were deep hooked in the gut or gills, and all of these died, however as observed in many other studies, circle hooks were identified as having a much lower probability of deep-hooking than rigs using J-hooks. Some fascinating data were also obtained by attaching an accelerometer to the terminal tackle of the fishing gear. In each case, soon after the hookup at depth each fish ascended of its own volition from around the thermocline to near the surface at a reasonably rapid rate (in as little as 6 minutes but on average 11 minutes), after which they then descended to a depth generally above the thermocline (~50 to 150 m) where the majority of the fight occurred. The researchers suggested that this was probably due to the relative lack of oxygen around the thermocline, and that an experienced tag and release crew could, in theory, exploit this behaviour by backing the boat down quickly to provide an early opportunity to tag the surfacing fish and quickly release it to maximise its survival. This evidence of rapid voluntary vertical movements of broadbill is consistent with acoustic tracking from other studies, and makes the issues with barotrauma upon release a bit of a mystery, given it seems that broadbill are well adapted to making rapid, large scale depth changes of several hundreds of metres on a daily basis as they migrate towards the surface at dusk to feed in the shallows at night. While exhaustion related to angling duration was hypothesised as a potential reason why some fish could not revive and swim back down, another explanation is a physiological one. Lactic acid buildup will occur in the fish’s blood due to exercise during the fight, but it is also known that lactic acid is what stimulates the swim bladder gas gland of fish to generate gas. When pH drops in the blood within the gas gland, it expels gas into the swimbladder and this is how fish can fill their swimbladders with gas, even at extremely high pressures at great depth. So it’s possible that broadbill don’t necessarily suffer from “true” barotrauma (or pressure damage), but more the symptoms of lactic acidosis. Either way, the research confirmed that given their 50/50 chances of survival, large broadbill caught deep dropping are not good candidates for catch and release only fishing, and that the decision to release should be carefully considered based on an absence of deep hooking and an ability of the fish to recover from “barotrauma” symptoms within 5 minutes of revival. Thus recreational fishers targeting large broadbill, even with the intention to release, should be prepared to take a fish to eat, if they do not recover quickly. One other fascinating aspect of this research was the movement information gleaned from the surviving broadbill which were satellite tagged. The surviving fish were tagged for an average of 203 days, most moving north or north east past Victoria and NSW and up into the waters offshore from the Great Barrier Reef. While all tagged fish stayed within the Tasman and Coral Seas, one migrated 3762 km to near the Solomon Islands, before heading back south. In most cases, the tag detached before it could be determined how far south the fish was likely to return, but one fish returned to within 100 km of its release location after a journey of approximately 5,400 km, indicating that broadbill off Tasmania may undertake home-ranging behaviour, which could mean the fishery, if it continues to expand, could be susceptible to localised depletion. For full access to this highly interesting pilot study, click HERE.